There are times when failures still turn out in success. Take this breakfast for example. This meal wasn’t suppose to be a grain salad topped with eggs. Nope. It was suppose to be an omelete stuffed with melty goat-cheese, sweet potatoes, and wheat berries. But sometimes my best laid plans don’t pan out, the omelete sticks, and I’m left with some semblance of scrambled eggs (which were still delicious but very far from photogenic). So I made this again and instead of an omelete, I whipped up some over-easy eggs and called it good. This meal is really about leftovers. I always cook too many grains when I’m cooking a meal and then have odd and end containers floating around my refrigerator. This is a way to use those up for breakfast! Preheat oven to 400˚. Peel and cut sweet potatoes in to 1/4″ cubes. Toss with 1 tablespoon olive oil, salt, and minced rosemary. Roast for 15-18 minutes until sweet potatoes are tender. 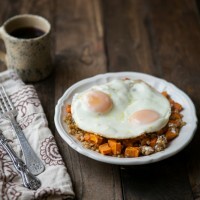 Toss together wheat berries, sweet potatoes, goat cheese, and 1 tablespoon olive oil. 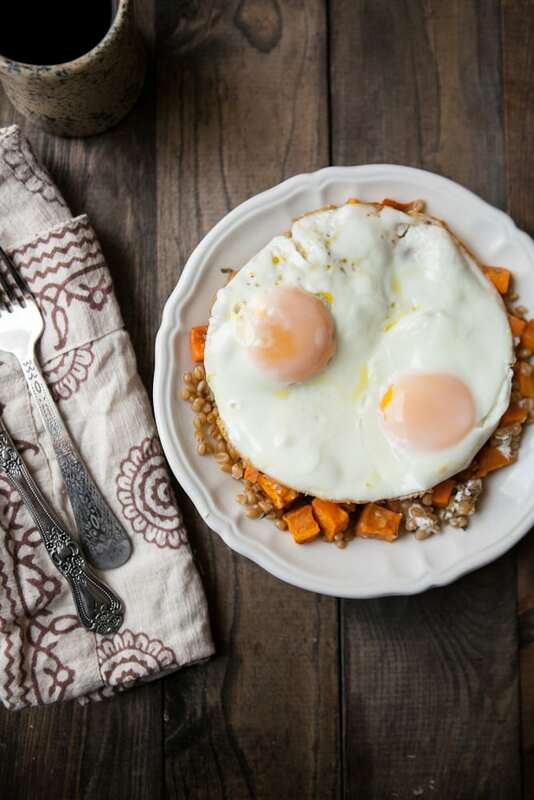 Prepare eggs to your liking and serve with wheat berries. *Wheat berries can be made well ahead of time. Also, other grains can be substituted for the wheat berries. This is great for left over grains floating around. I love when disasters turn into beautiful ones! This looks great. 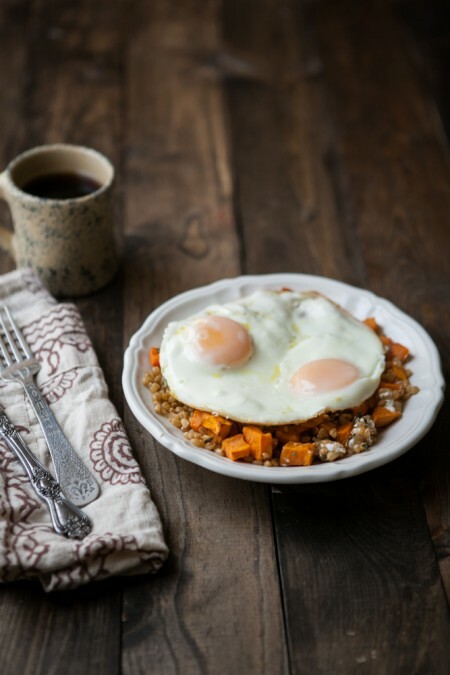 Simple, breakfast-for-any-meal-of-the-day recipes are great for the busy days surrounding the holidays. I always have leftover grains so this is such a good way to use them up! I usually make too many grains too – never thought to use them for breakfast. Great idea!